Duel Pole Doppler Radar, AccuWeather, and other familiar names help to bring us our weather forecast every day. 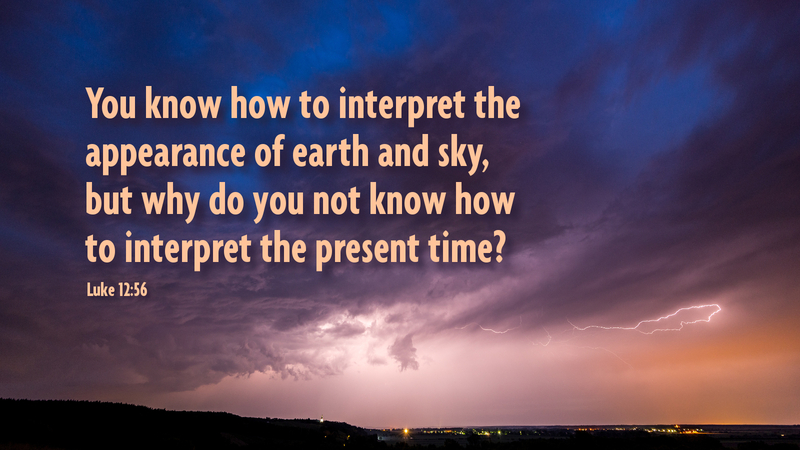 Agencies spend billions yearly looking for ways to improve our understanding of God’s creation and on how to better predict the forces of nature. The benefit is that tornadoes and hurricanes are predicted and tracked more efficiently giving us early warning of what might be coming in order to prepare. Along the Atlantic coast, people are advised of hurricanes days ahead of time, allowing us to track in “real-time” the progress of a storm. Even less dangerous weather, like snow storms, get plenty of attention allowing people the opportunity to stock up on essentials. But what about the time we spend studying and discerning God’s will and Word? How much effort is expended looking at the signs of the times? Are we so busy looking at the clouds that we fail to see the devil at work, ripping apart homes, communities, and nations through hatred, greed, and self-centeredness disguised as freedom, religious fanaticism, and individual rights? Jesus gave us an early warning that we need to study his words and deeds with even more enthusiasm and understanding than we do the weather. Prayer: Heavenly Father, help us to see the signs of your kingdom through your word today, in Jesus’ name. Amen. Today’s devotion was written by Steven King, Pastor of Bethel Evangelical Lutheran Church in Lincolnton, NC.